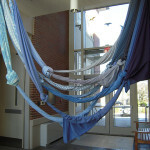 The installations pictured here are site specific, created for the architectural, lighting, and other characteristics of a location. 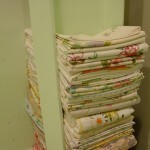 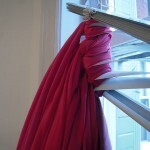 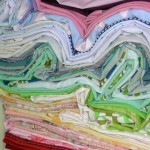 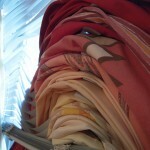 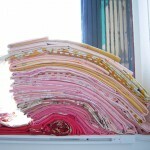 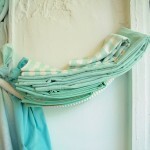 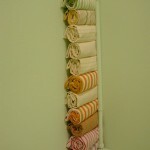 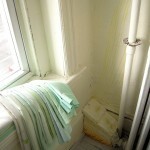 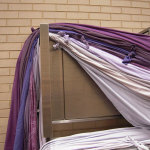 Materials are unaltered bed sheets and pillowcases, unless otherwise noted. 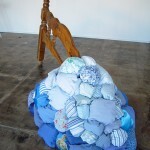 My great aunt Inez Pitts passed away just after Thanksgiving last year. 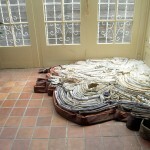 She never married and lived for most of her 94 years in a house at 302 Richard Street in Hot Springs, Arkansas. 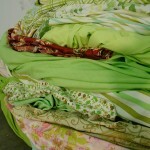 Like other people in my family, she was a person who saved things. 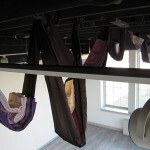 Every kind of thing: rags, spools, fruits and vegetables put up in jars, worn out socks, cookie tins, buttons, motel soaps, paper envelopes, plastic margarine tubs. 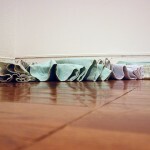 Just in case they might be useful, someday, somehow. 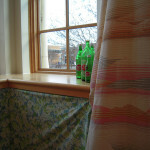 She was one of my last living links to my grandparents’ generation, those people whose young lives were shaped by the Depression, World Wars, and our country’s media and consumer explosions. 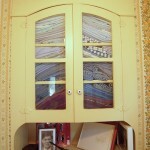 Her house was a kind of archive of this history. 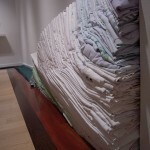 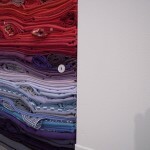 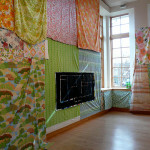 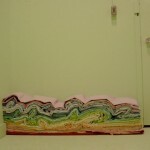 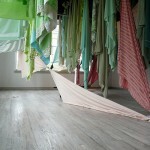 The work in this exhibition is a meditation on that lost world of stuffed-to-the-brim houses and their elderly keepers. 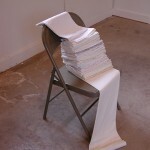 It represents my thinking about my own propensities in this direction, my artist’s instinct to keep things, just in case. 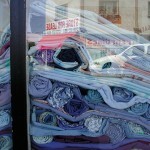 I’ll have a use for that someday, somehow. 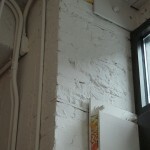 It is a return to old interests and ways of working. 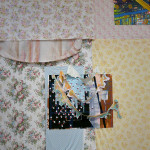 It is a collaboration between my aunt and me, as I have taken her fabric remnants, cut-out quilt pieces, assorted leftovers, and my memories of her and her house and fashioned them into new things to mark this passing. 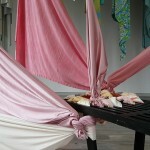 With a sense of loss comes a sense of freedom. 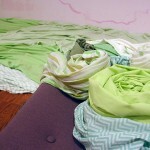 Make what you will of these scraps. 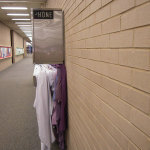 Someday is now. 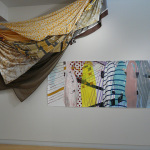 Foreground: Raise Your Own Flag, polyester fabric and thread, 5’x16’. 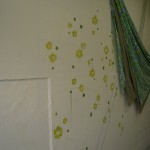 Background: When the Dew is Still on the Roses, bed sheet and mixed media installation with paintings on paper. 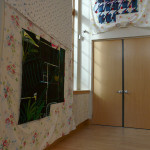 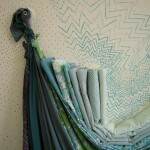 Foreground: Night Quilt, polyester pieced quilt top with gallery chair. 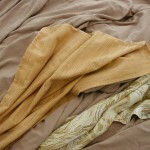 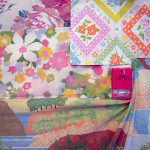 Background: Sunrise Service, polyester fabric with thread, 4’x6’. 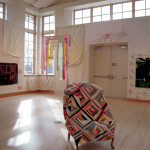 Foreground: Night Quilt, polyester pieced quilt top with gallery chair. 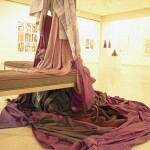 Background: When the Dew is Still on the Roses, bed sheet and mixed media installation with paintings on paper. 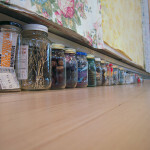 Keep Everything, mixed media in glass jars, dimensions variable. 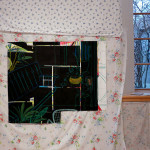 Foreground: Night Quilt, polyester pieced quilt top with gallery chair. 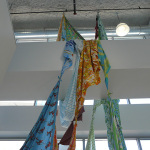 Background: Raise Your Own Flag, polyester fabric and thread, 5’x16’. 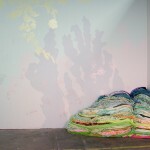 When the Dew is Still on the Roses, bed sheet and mixed media installation with paintings on paper. 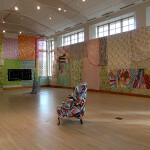 Overview of solo exhibition Keep Everything, BlackRock Center for the Arts, Germantown, MD, January 7-30, 2016. 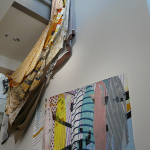 All works 2015. 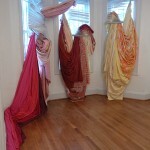 When the Dew is Still on the Roses, bed sheet and mixed media installation with paintings on paper. 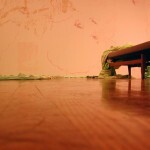 Painting pictured is Lakeview Road. 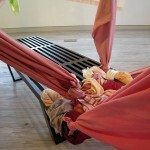 Detail image, When the Dew is Still on the Roses, bed sheet and mixed media installation with paintings on paper. 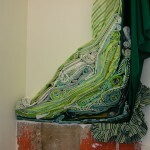 Detail image, Raise Your Own Flag, polyester fabric and thread, 5’x16’. 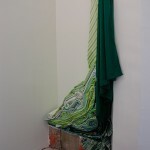 When the Dew is Still on the Roses, bed sheet and mixed media installation with paintings on paper. 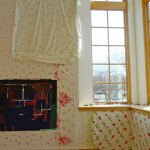 Painting pictured is 302 Richard Living Room. 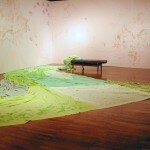 When the Dew is Still on the Roses, bed sheet and mixed media installation with paintings on paper. 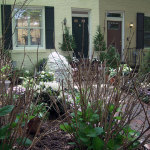 Painting pictured is 302 Richard Front Porch. 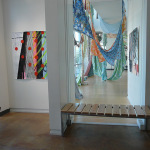 When the Dew is Still on the Roses, bed sheet and mixed media installation with paintings on paper. 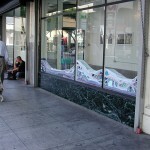 Paintings pictured are 302 Richard Front Porch and Buick Interior. 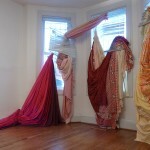 When the Dew is Still on the Roses, bed sheet and mixed media installation with paintings on paper. 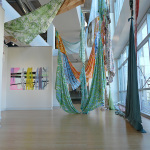 Paintings pictured are Amana Magic (lower) and Leotard (upper), along with Keep Everything, mixed media in glass jars. 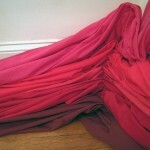 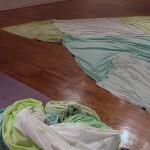 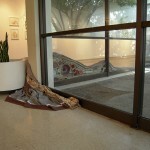 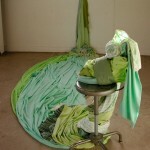 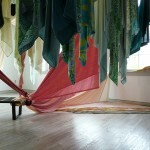 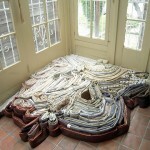 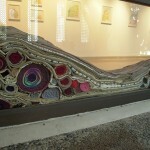 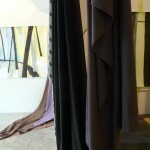 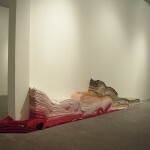 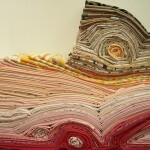 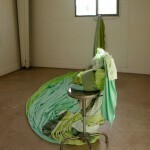 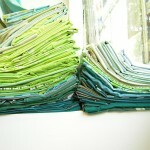 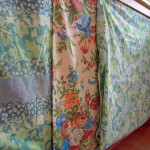 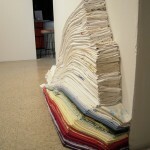 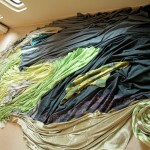 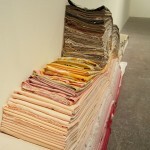 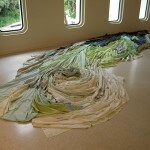 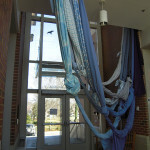 Foreground: Sunrise Service, polyester fabric and thread, 4’x6’. 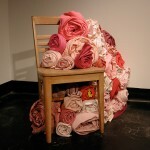 Background: When the Dew is Still on the Roses, bed sheet and mixed media installation with paintings on paper. 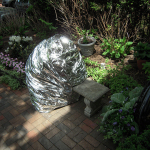 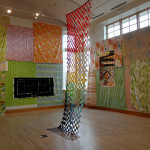 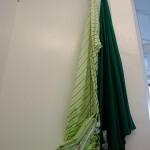 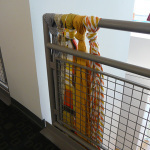 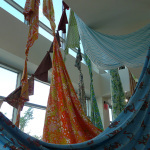 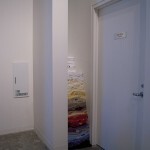 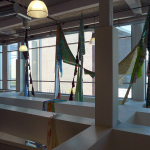 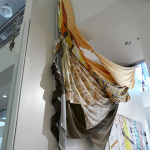 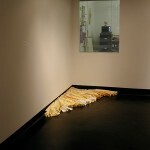 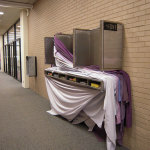 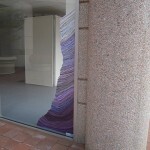 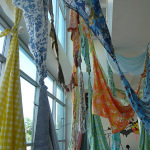 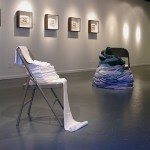 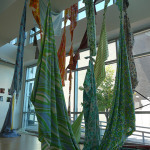 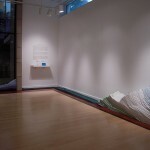 The following images are documentation of large-scale installations in the King Street Gallery at Montgomery College in Silver Spring, Maryland, created in fall 2014. 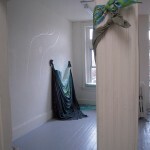 Titled Daydream Believer and Believer 2, these works were part of a two person exhibition with Mei Mei Chang, whose wall-based installations also appear in some photographs. 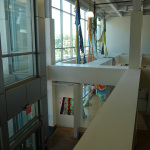 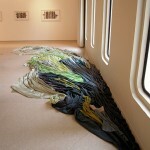 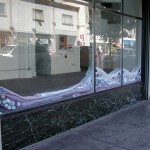 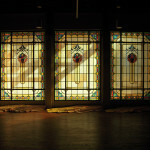 The works were an exploration of the large-scale windows and intricate architecture of the gallery space. 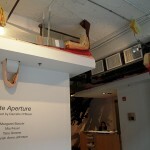 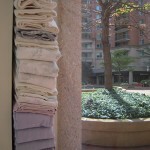 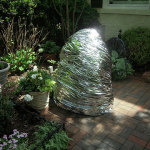 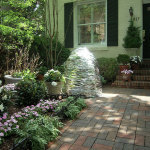 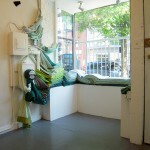 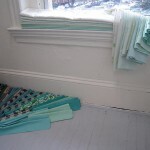 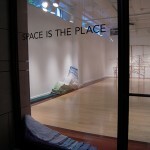 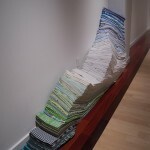 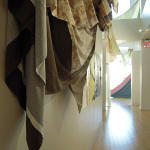 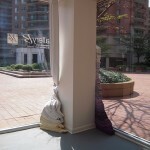 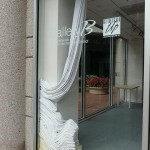 The following images are documentation of In the Pines, a large-scale installation at Flashpoint Gallery in Washington, DC, created in fall 2012. 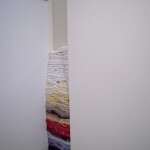 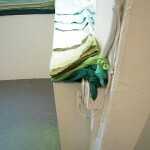 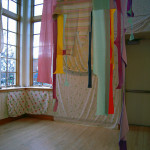 This work was an exploration of the connections between painting and installation. 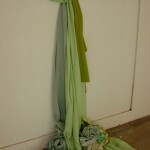 Materials included bed sheets, twine, mothballs, and acrylic, latex, and watercolor paints on paper and wall. 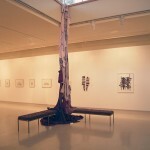 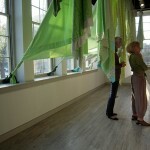 The following images are documentation of Forest of Correction, a large scale exhibition at the Arlington Arts Center in Arlington, VA, created in spring 2011. 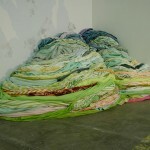 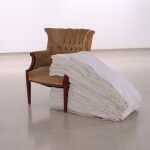 This work marked a shift to room sized works that could be entered by, and engulf, viewers. 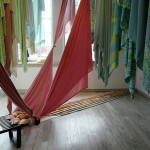 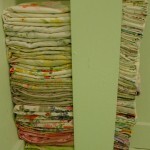 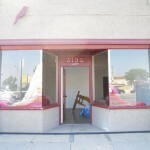 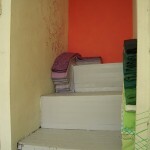 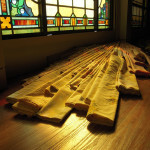 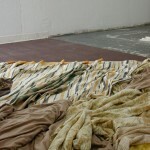 Materials included bed sheets, pillowcases, and gallery furniture. 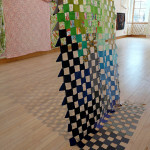 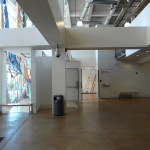 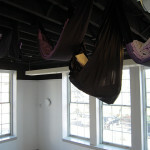 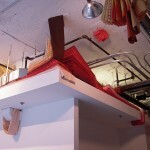 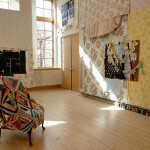 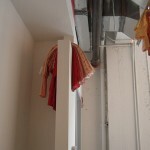 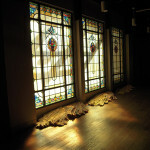 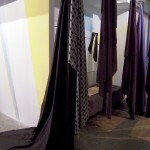 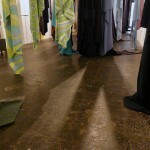 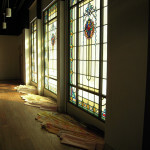 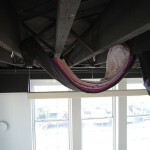 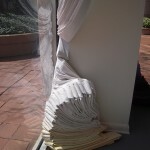 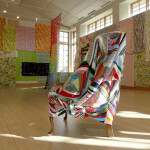 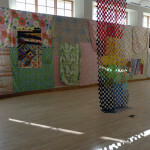 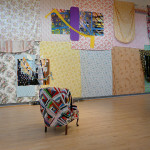 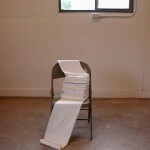 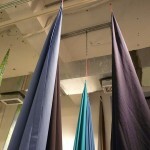 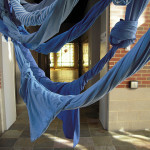 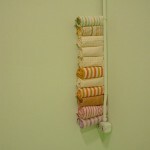 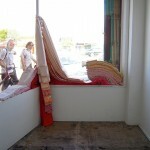 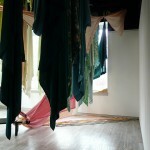 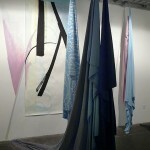 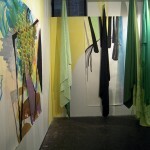 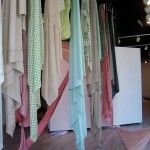 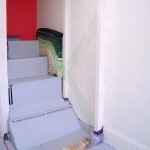 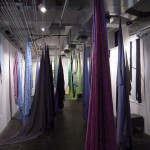 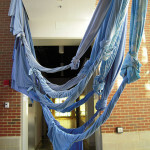 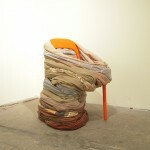 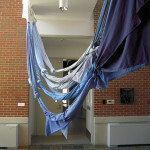 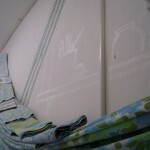 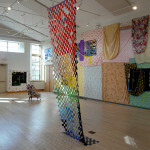 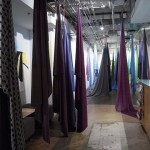 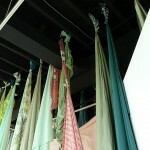 The following images are documentation of Studio, a large-scale installation at Harmon Art Lab in Washington, DC, created in fall 2011. 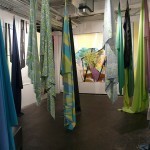 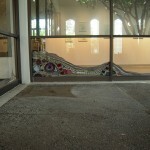 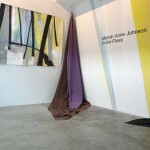 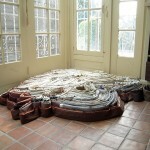 This work was an exploration of the connections between painting and installation. 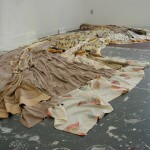 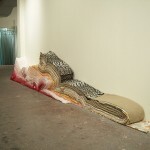 Materials included bed sheets, pillowcases, and acrylic and latex paints on wall.